22 new entries added to rain slogans, that include pictures. 1. Let it rain, let is pour, without water, the land is sore. 1 Let it rain, let is pour, without water, the land is sore. 2 It feels so hot, It feels so dry, When will water fall from the sky? 3 No rain means much pain. 4 Acid rain is like sky tears, it ruins all your statues and gear! 8 Rain is a gain but acid rain is a pain so avoid deforestation to stop the devastation. 10 Rain from polluted sky, makes me ask why and cry. 12 Where theres a will, theres a way so make the will to be green starting today! 13 Pollution rises, Acid rain falls. 16 As the acid rain falls, will you hear the animals calls? 17 Acid rain turns plant nutrients to dust, and the outdoor statues are beginning to rust! 18 Acid rain ruins the finishes on your cars, it can even rust metal bars! 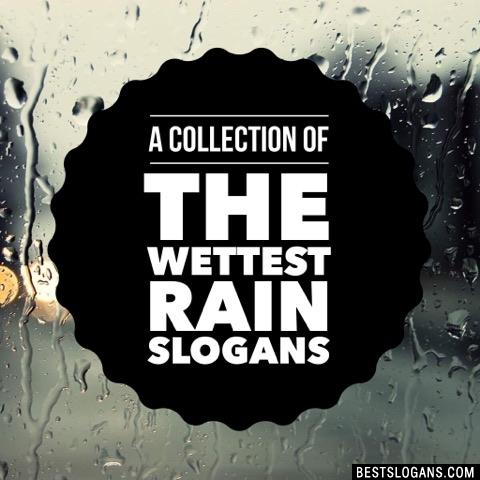 Can you think of a good Rain Slogans we're missing? Or come up with a clever one of your own. Please share below.